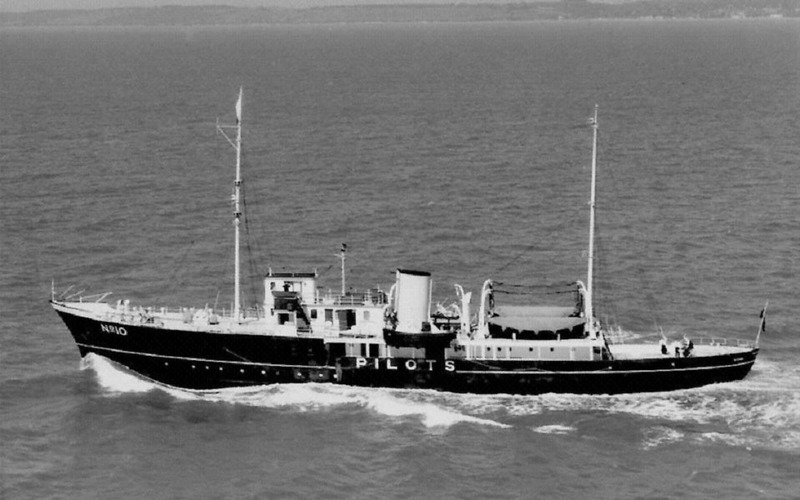 Steel twin screw motor vessel built built in 1929 by Camper & Nicholson, Southampton (Yard No. 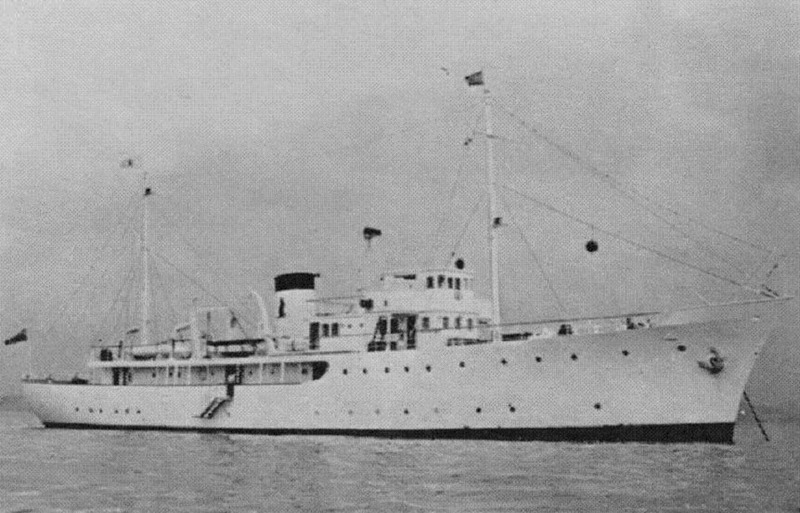 375 ), for J Fuller Feder as a Private Yacht. 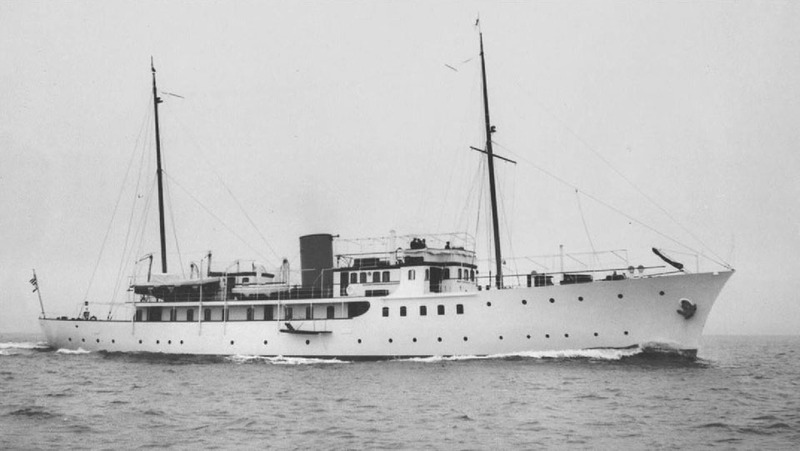 July 1930: Completed as a motor yacht for Mr. J. Fuller Feder of New York. 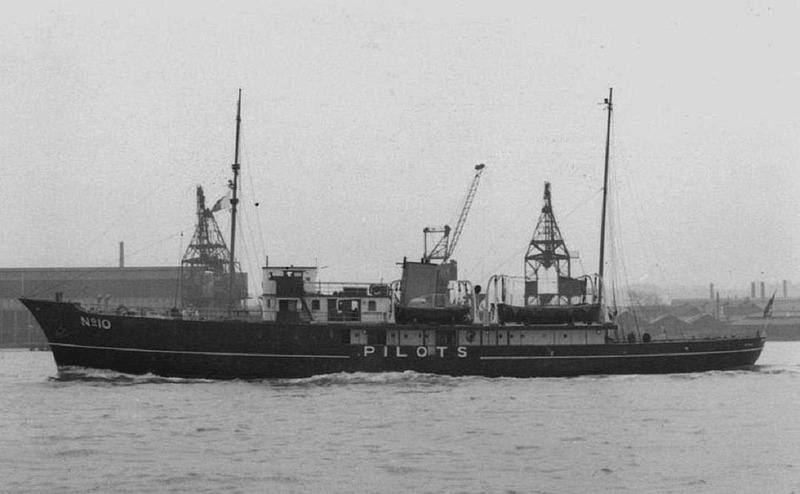 1961: Replaced by PATROL. 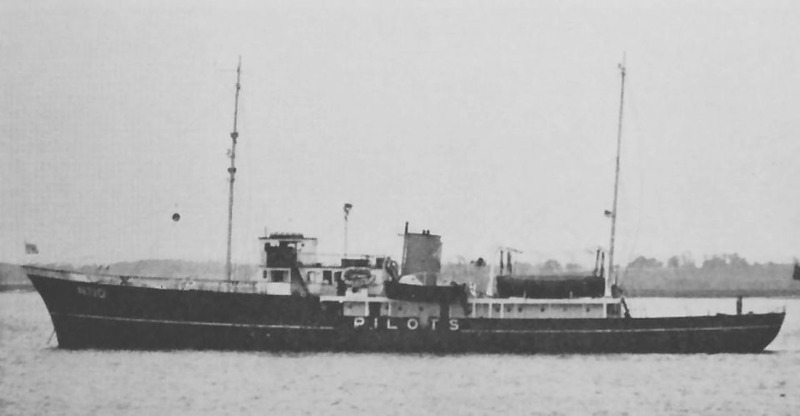 Also served at Harwich as a relief for the Harwich-Sunk tender VIGIA. How things happened. 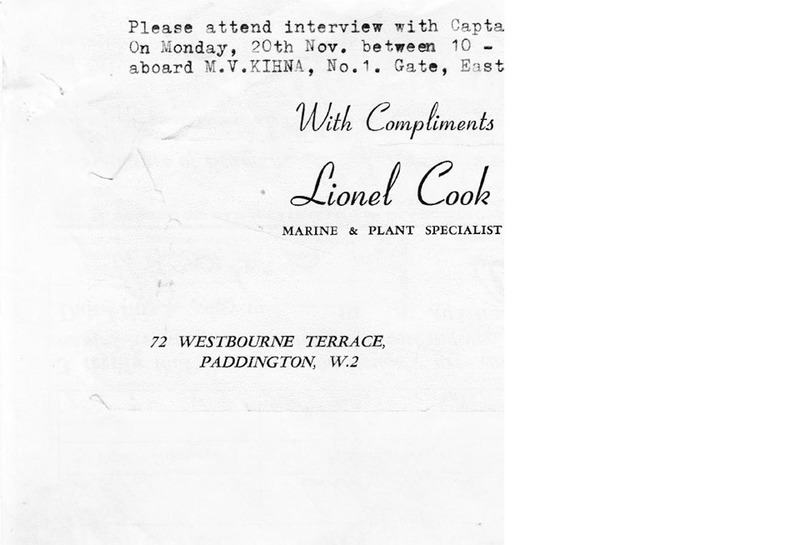 Donald, D. Macdonald bought the yacht through a yacht broker Lionel Cook, London, in 1960, for 45000 pounds Sterling. He had recently sold his half share in a private company for 2 million pounds Sterling. He set up a business called Yarra Investment Trust, Sandringham House, Shirley St, Nassua, Bahamas. Bought the Kihna. It became the company yacht. The owner used it as a floating office. The broker, ships captain, his son, an engineer and a deck hand got the engine running and sailed up to London. 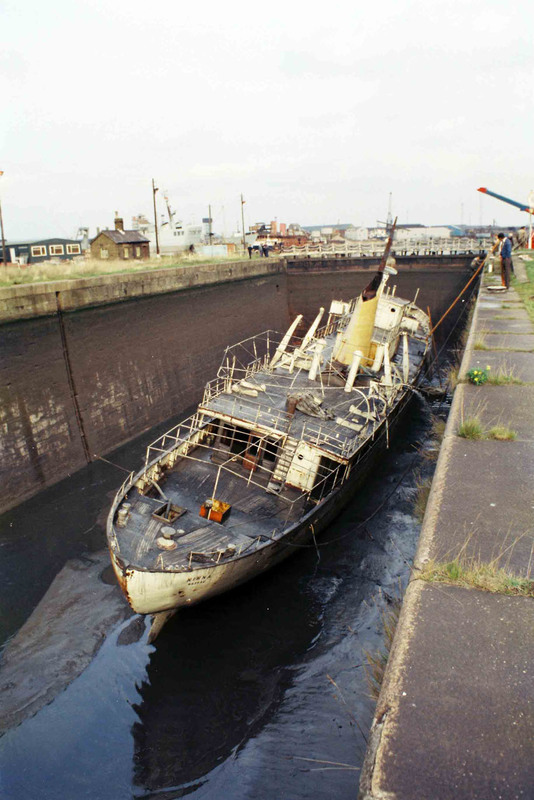 She was moored in East India Dock. They put an ad. in the East Hackney Gazette. Wanted. ; Captain ,Engineer and crew for yacht going on world cruise. I saw the ad. and rang the number. 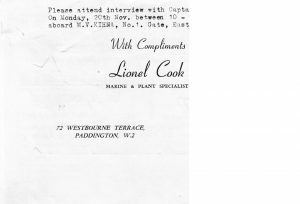 Told Cook’s secretary my qualifications, seven years, A.B. Australian Coastal Trade. Two days later I received a letter with a note telling me to go for an interview. I was to report to Captain “Spike” Gamble. He was ex R.N. W.W.2, Motor Torpedo Boats. retired, invalid. The appointment was in an office by the gate of East India Dock. I showed him my papers. We talked. He hired me , and I took my gear aboard. I chose a cabin forward. I was the first man hired. During the next six months , there was a lot of activity on re-furbishing the Kihna. The life boats were removed. The davits for the two aft life boats were removed. 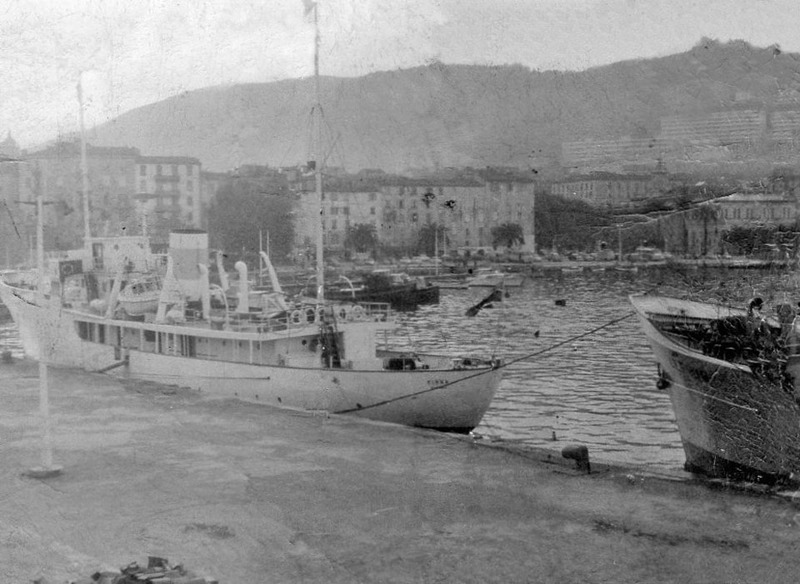 The petrol motored “shore boat” was moved to the Port side davits. A speed boat was slung from the forward starboard davits. 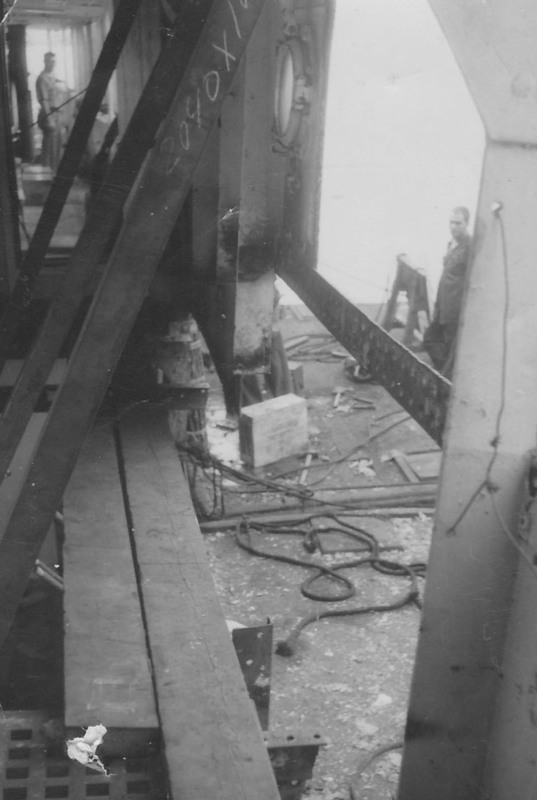 Note: Looking at the sad sight of the KIHNA laying on her side in the dock, I notice that the davits remove in London, were re-placed at some time after March, 1963. Also noted that the masts, shortened in the London refurb. ,had been removed and the funnel modernized. A sailing boat , 14′, was slung from newly fitted Goose neck davits , aft of the speed boat, starboard side. 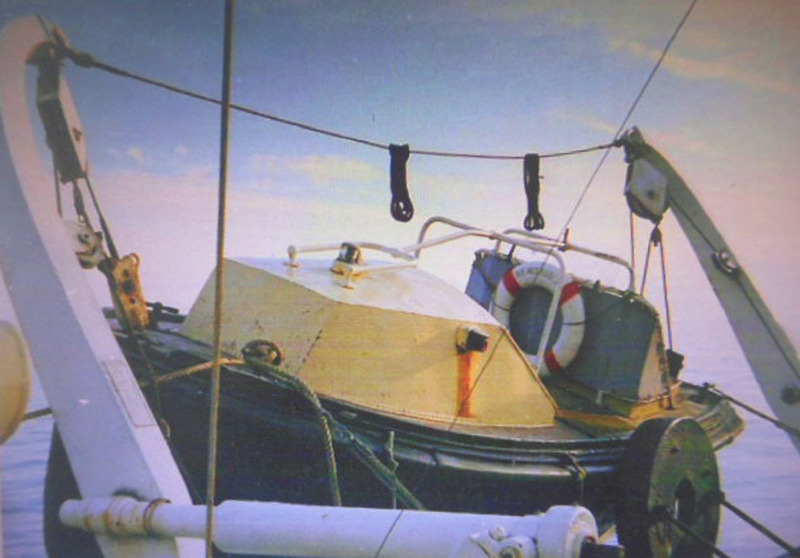 A rowing boat was slung from new goose neck davits, aft of the shore boat , port side. Pics. 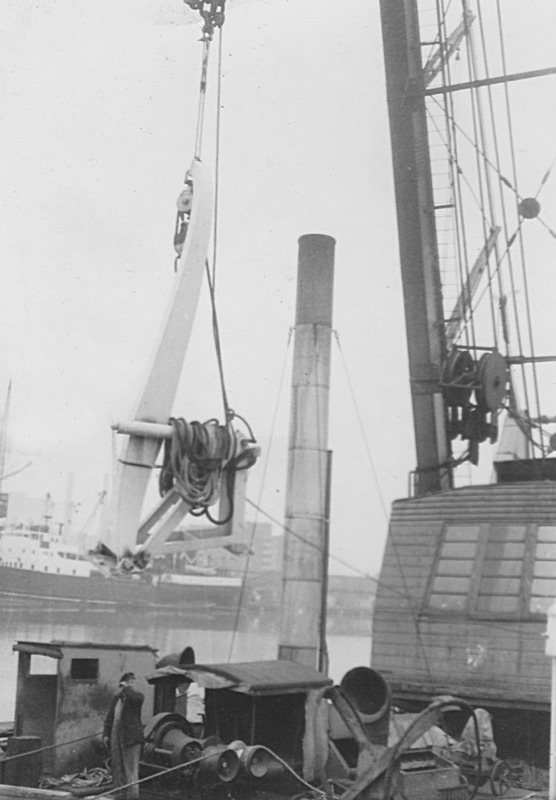 shows giant, steam powered, crane, lifting davits and masts. The owner thought the masts were too tall; had them removed , shortened and re-installed. Auto. steering system fitted. 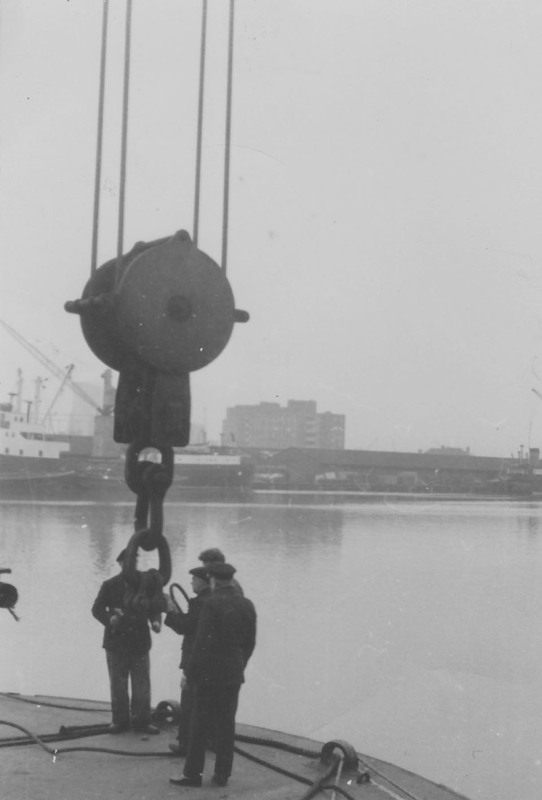 Half a dozen workmen, from a nearby ship yard, worked each day doing all sorts of things. A large, 6 m3, freezer was installed . The owner’s quarters were fitted out. Thermal insulation, 200 mm thick, was installed in the owner’s, officers’, and guests’ quarters. 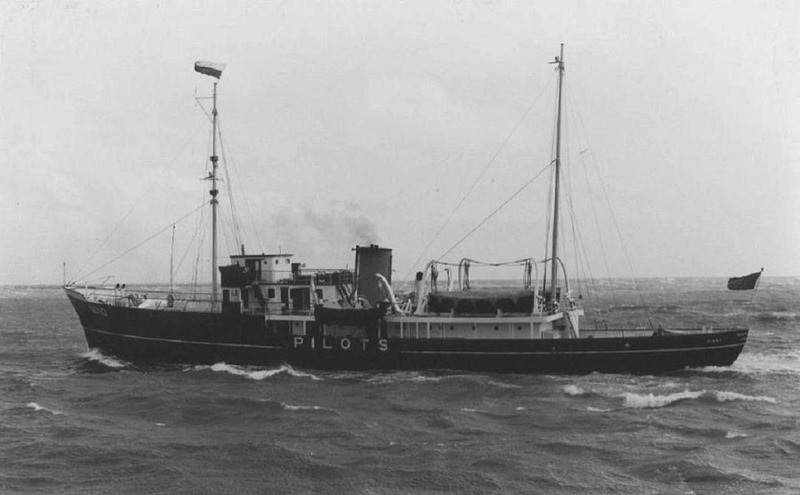 To improve the engines working , an older engineer , from the Sulzer company that built the engines , was brought over . He seemed to always be doing something. After a few weeks , we got permission from the dock authority to test run the engines. 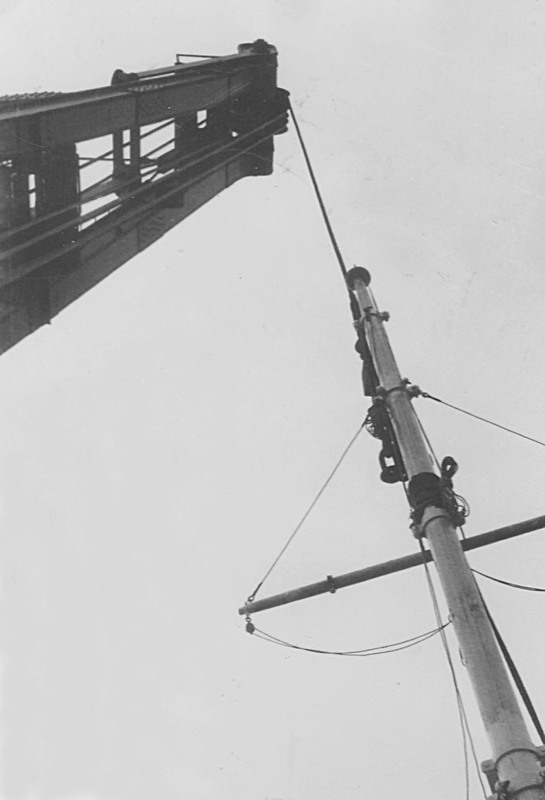 Devices were fitted on top of the valve gear. There was a roll of paper , and as it moved along , the movements of the valve was recorded. Made a graph. The engineer went back to Sweden. A fancy , wood and brass gangway was made and fitted to the port side. The boat boom was swung out and tested. Attached pic. shows some crew members “testing” the boom. The owner met various people who were invited to “Come for a cruise.” They were people who had abilities that could be useful. A Marine architect and his wife came along. He designed the new gangway. Newly hired deck and engine room crewmen came and went. Many had thought that the yacht was ready to go. A few days in the un-insulated quarters (it was winter, coldest winter in 70 years, snow on the deck) no heaters, no hot showers, helped them decide to leave. Even In the warmer weather, they became bored and left. Everything was taking so long. A total of 32 would-be crew members came and went. 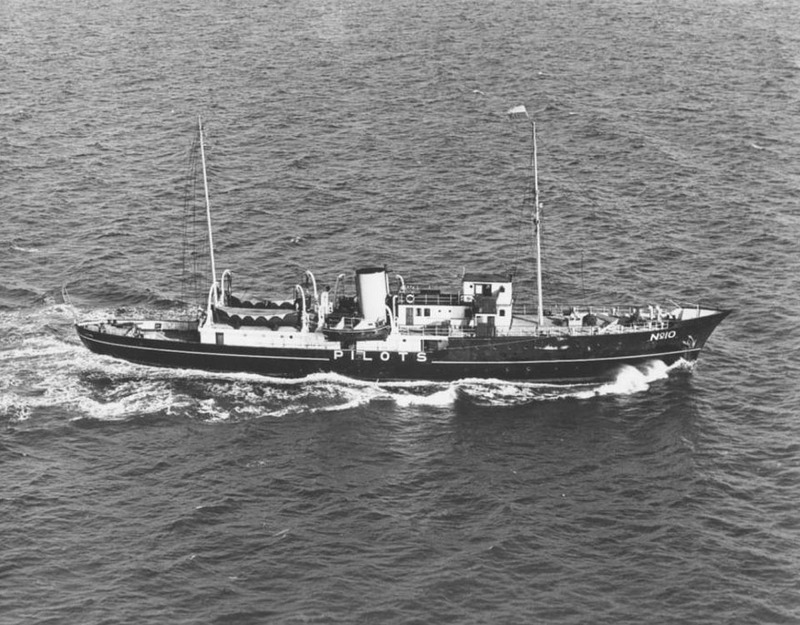 About May, 1962, we finally left London on a shake -down cruise to Falmouth. The yacht was flying the flag of the Bahamas, where it was registered. We anchored out. 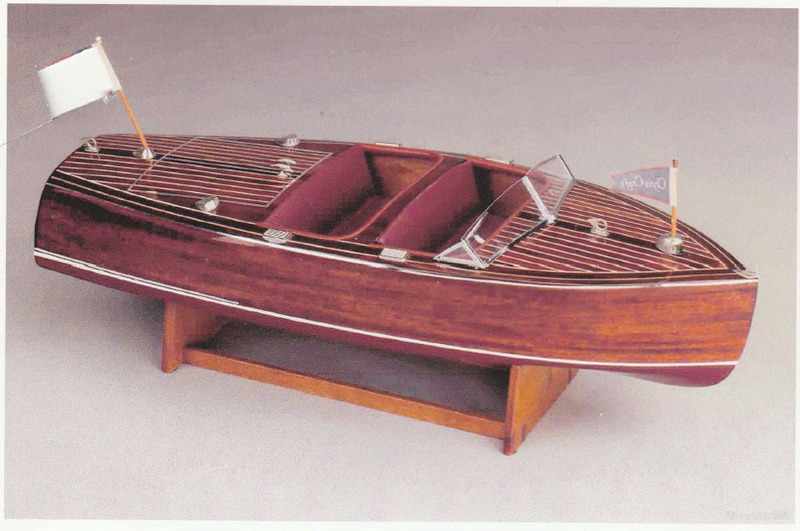 The shore boat was in daily use. In the sheltered waters, the new gang plank was very useful. The weather was pleasant. We left after about 12 about days and went to Brest, the chief naval port of France. Kihna left Brest and went to Spain, St John’s Eve, Algerciras. Anchored in harbour, astern of a large, 10,000 tons, Spain to Morocco, ferry. Next morning, that ferry reversed into us, rolled us, buckled and split plates , Port side. Went to Gibraltar for temp’y repairs to get to Barcelona for full repairs to enable us to go deep sea voyaging. Image hows how extensive those repairs were. Image is very much like the owner’s speed boat. I borrowed this image. 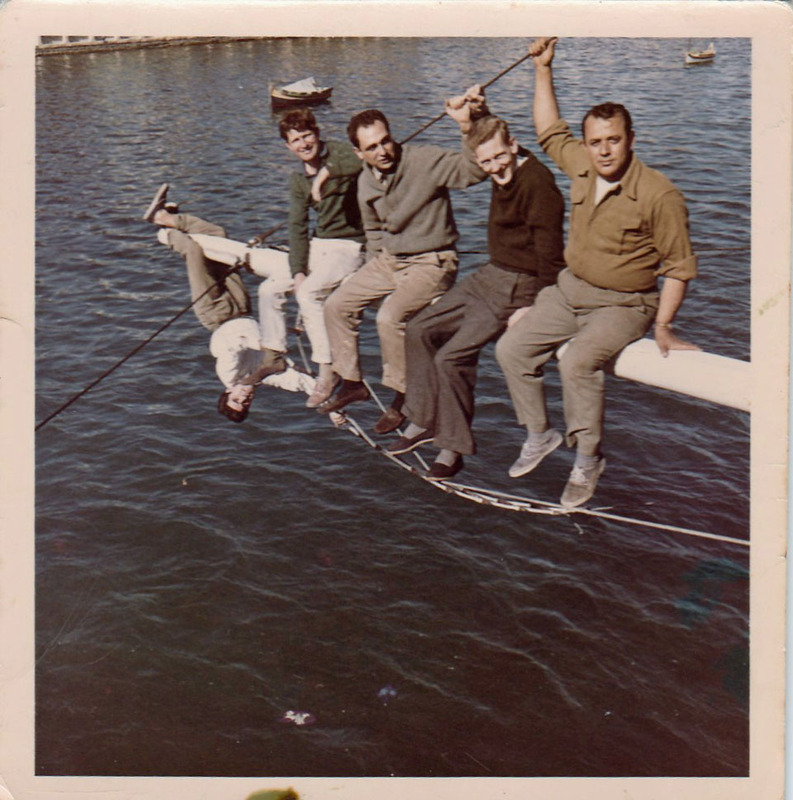 Kihna, Barcelona, summer ,’61. Having the Algerciras collision damage, properly repaired. The owner, at the time , called the damage, “superficial”. The tower in background was one of two with an observation car travelling between them. 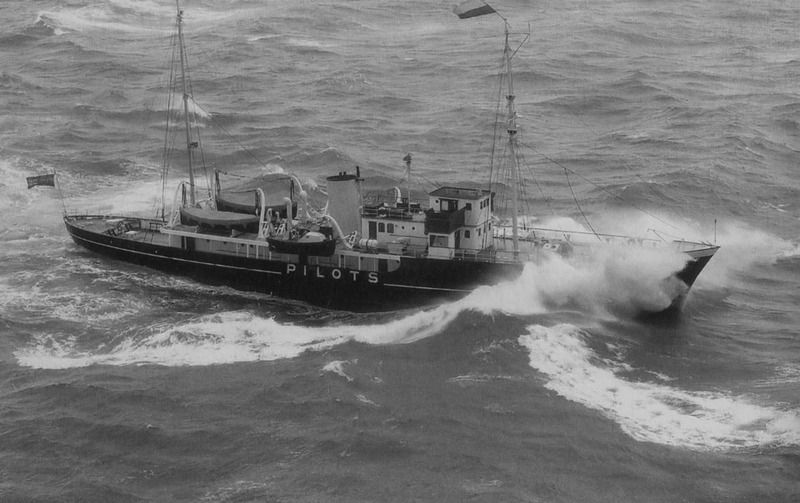 This image of the boat that takes the pilots to the vessel where needed, is from another site. It looked so much like the motor boat from the Kihna, I thought it was a mistake. Then noticed the navigation lights. Our boat did not have any. Browsed further. It seemed as though that design was a standard one. 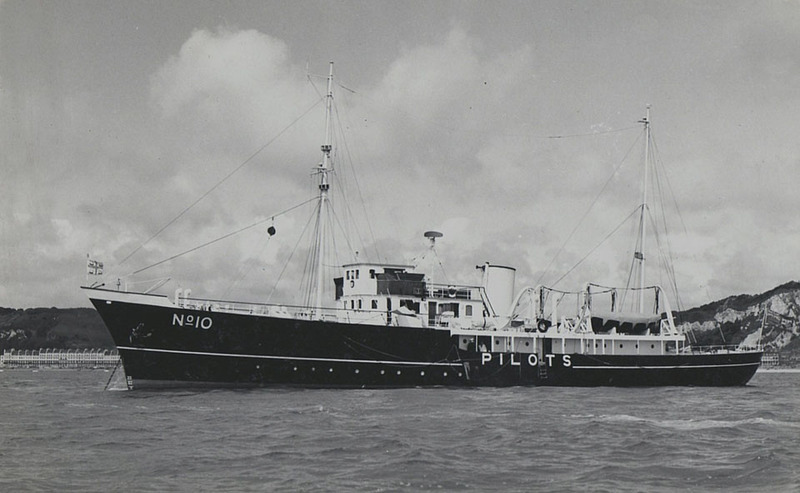 That type of boat was thought to be best for pilot transfer. Had nice cuddy (small cabin ) holding four pilots, then a canvas dodger protecting the coxswain/driver. Left Barcelona. Image of Kihna in Malta in her nice white paint , done in Barcelona. Motored North to Pt Vendres, Southern France. Departed for, Ajjacio, Corsica . Sailed out straight into a storm, the Mistrals. Battled the storm for 30 hours. Turned around and returned to Pt Vendres. As we re-entered the harbour, the wise old heads were nodding. We’d been warned . Two days later tried again and had much quieter passage to Ajaccio. Before leaving Corsica we went to a very interesting castle city on river mouth city called Bonfacio. Napolian served as Corporal there. On to Naples, Syracuse in Sicily and then for a couple of weeks in the Grand Harbour, Malta. From there to Crete, Rhodes and few of the Greek Isles. Cyprus was next. The owner was interested in buying property there. He sent Mr Preston, 1st officer , and me ,to a place in the North to meet a prominent property agent. I sat around for a couple of hours while they talked business. We then drove back, stopping to look at the Castle of St Hilary. Spent about three weeks in Famagusta. End of January sailed to Piraeus , the port for Athens. Later it was off to the Corinth Canal. A very impressive engineering structure. We were small enough to fit through. Middle of February returned to Malta. March. Malta. My wife and I left the Kihna and travelled to Perth, West Australia, my home city. 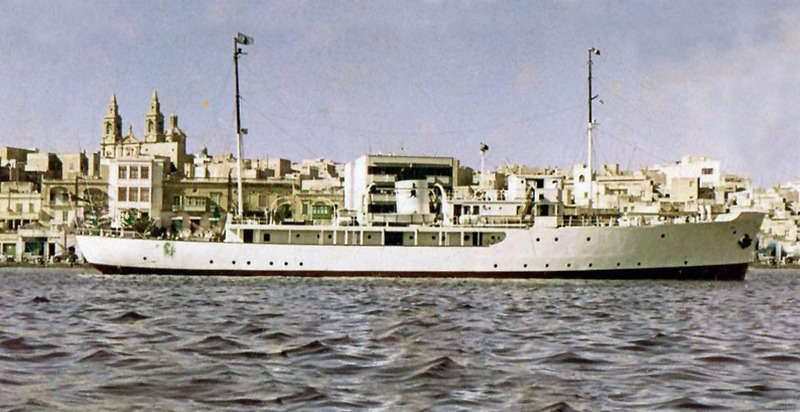 1964: Transferred to Maltese Flag. 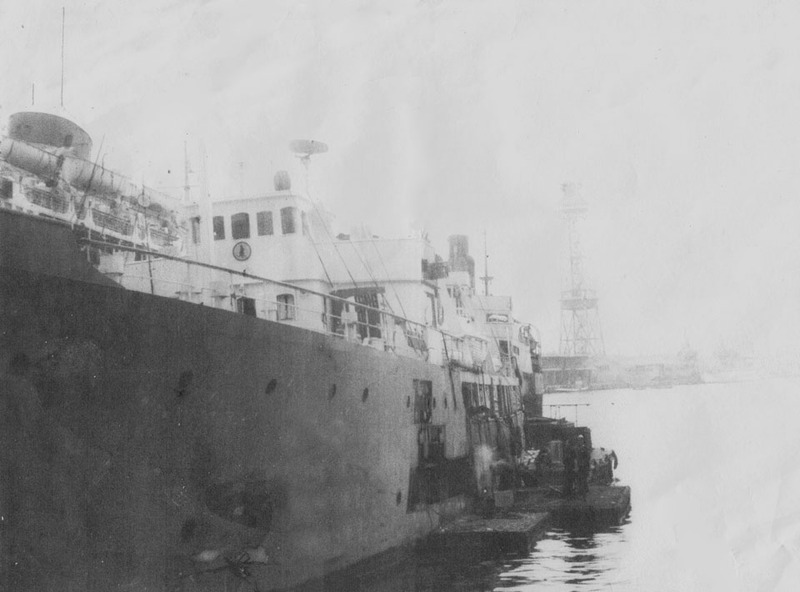 1972: Laid up at Ta’ Xbiex berth Malta. October 2nd 1975: Left Malta for Cardiff. 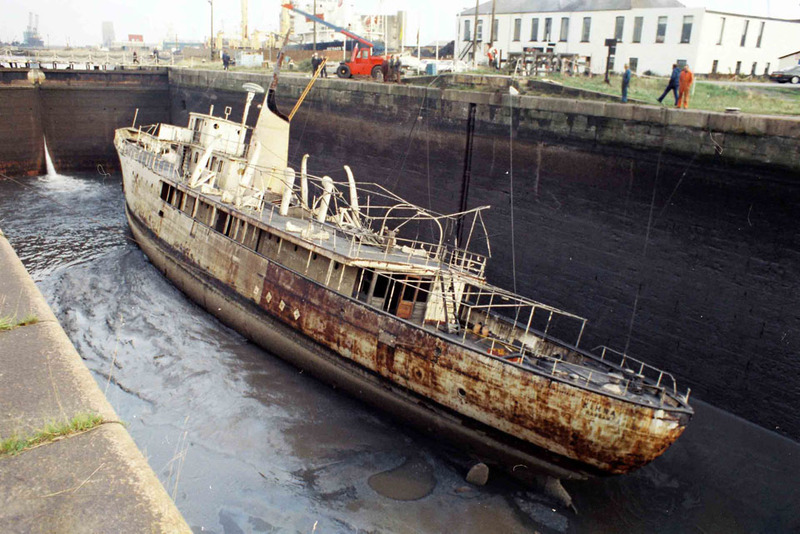 1983: Known to be berthed at Roath Sea Lock, Cardiff awaiting full refit and conversion at the Channel Dry-Dock. 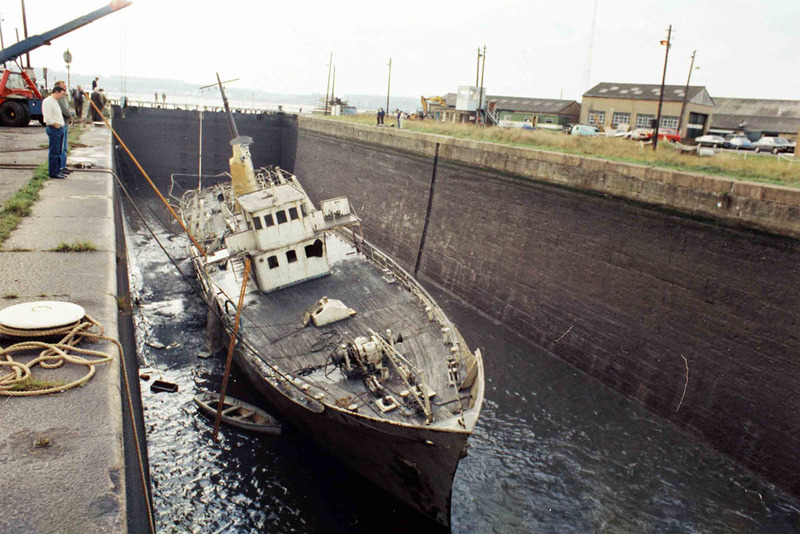 1983: Vessel submerged following theft of brass ballast/inlet valves. 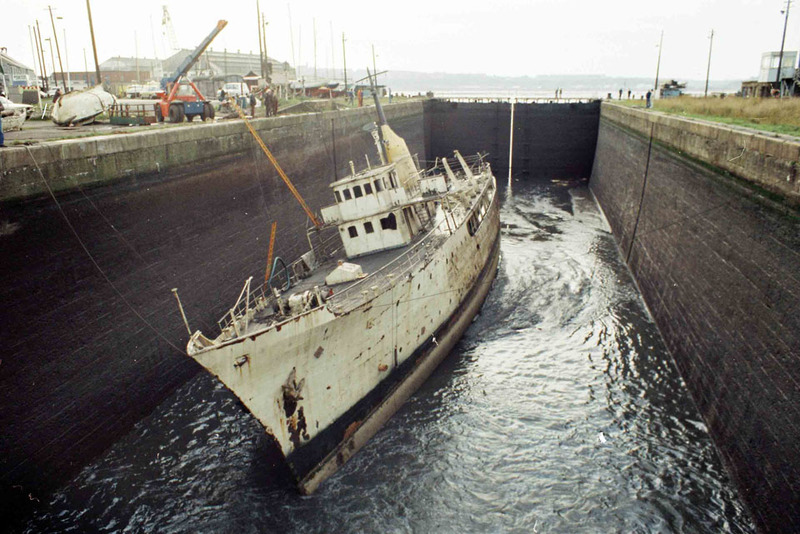 Lock drained and vessel eventually re-floated. Not considered a viable proposition for restoration and towed away for scrap. Destination currently unknown. All information is believed to be correct and no responsibility is accepted for any errors or omissions. All items included in this article are subject to © copyright. We would like to take this opportunity of thanking: Ed Connell, Neil Jones (Trinity House Archives) and Andy C Adams for their assistance in producing this feature.